Relax, you are with friends. We don’t preach, we don’t judge, and we don’t dictate how you should live your life. We all have ways of dealing with how reality impinges on the ideal life we think we should be living. For many, that involves some kind of religion or spirituality. One could say that religious faith in general is irrational, in that it is not based on observational evidence and logic. This is not to say that the faithful are irrational people, or that their beliefs are necessarily incorrect. The fact that something can’t be measured scientifically does not make it untrue. Anything is possible, including the improbable existence of supernatural gods. For some, it only makes sense to live according to what appears to be true, based on experience. For others, logic and evidence are not enough. We might imagine no religion, but we seem to be psychologically made to be more comfortable with mythology and ritual. Some of us believe that we create our own destiny. Others are sure that our fate is in the hands of a higher power. In any case, the debate is interesting. We don’t have to always agree. The differences between us add color to the tapestry of our existence. For more information on goddesses, see Infinite Goddess. For a guide to the Greek Pantheon, see Theoi Greek Mythology. As you may know, these illustrations are only a small sample of the myriad ways people conceive of their gods. Some of these depict actual or legendary human beings who are often considered to be gods. Some religions discourage or forbid visual representations of their gods or prophets. Finally, some religions do not promote concepts of all-powerful spiritual beings. 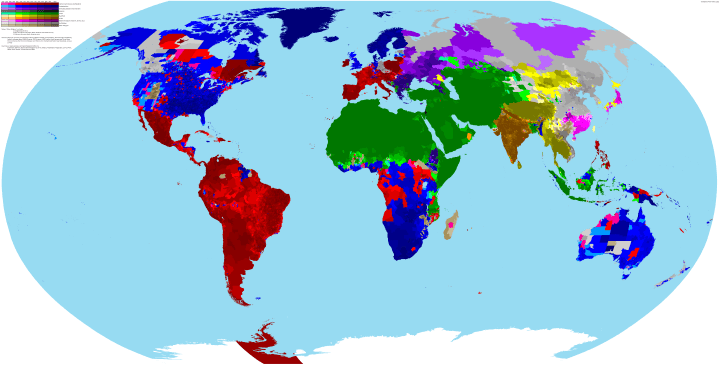 To explore this map of where major world religions are found, go to Brilliant Maps. Featured image: Freya, by Sedeptra, from Leaves of Awen. Freya (Freyja, or Frige) is the Norse goddess of mediating peace and violence. Images from: Deviant Art, Yogalomi, Tsemtulku, Orishanet, Bible Scripture, Barton Galleries, IllustratedATCs, Karthic’s blog, Mucha Foundation, Fanpop, Nepali Thangka, Subzero, Catechism of Our Mother God, El Rapto de los Sentidos, Vanishing Tattoo, Fantastipedia, Like Success, Not All Who Wander Are Found, Deities and Demons, Land of Goddesses, and Alex Grey.